Be a part of The Big 6 at Nine! Kicks 96 needs your help to pick the music you hear at work! Get the gang at work together to pick your six favorite country songs, and let us know what they are. Chad and Ashley will play your Big Six at 9 every morning to get your day at work going in the right direction. They’ll credit you and your business, and who knows…there might even be prizes! What are you waiting for? Get your list together! 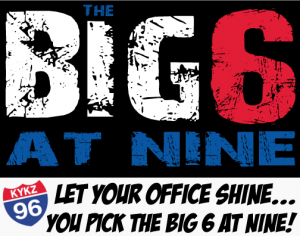 It’s the Big Six at 9, only from KYKZ, The Big Kicks 96!